Deciding when (or why) to restore a firearm is not as complicated a matter as would be indicated by the millions of words written on the subject. “RESTORING AN ANTIQUE WILL DESTROY ITS VALUE” is the phrase most often heard; but, what if its value has already been destroyed by a previous refinishing done badly by one of the great many hacks out there (especially true in the 50’s and 60’s), or what if it’s a pitted, rusty, brown or grey gun with numerous other problems? Basically, if a gun is not a “collector-grade” specimen, meaning that it has less original finish than what the collector is looking for (say less than 80% as a general guide), then its collector value cannot be considered in the decision to restore or not. 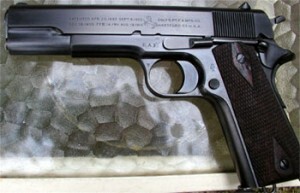 The exceptions are: (a) a gun with some documented historical provenance or (b) a gun of great rarity, both of which are factors that outweigh amount of finish or condition as collector-criteria. So, if a gun is in the less-than-80%/no-provenance category, it has a value to the “accumulator” (most of us), but no real “collector” value. Probably 95% of the guns coming into my shop are non-collector guns with little or no original finish, are often abused, pitted, gouged, dinged, prevously-overbuffed, hot-blued, cold-blued semi-wrecks in the less-than-10% category. Restoring these “bad-guns” and making them into “good guns” is what it’s all about. It’s either that, or let the effects of abuse and negligence eat them away until they’re gone forever. I frequently advise my customers not to “mess” with a particular gun if it happens to fall within the collector-grade range. On the other hand, if a collector-grade gun has something wrong with it, which is correctable, but which hurts the value if left uncorrected, I’ll often do a partial restoration to fix that one problem. As an example, I recently had a would-be collector-grade Colt single-action where the front sight had been filed down to nothing, and the barrel had been hit a few times in the filing process. I made a new front sight of proper shape and height, polished out the file marks and re-blued the barrel using the original nitre-blue, then “aged” it back just a little to match the rest of the gun. Could you tell? No. Did it hurt the value of the gun? No. Did it increase the value? Yes. Flayderman has written: “Refinishing is akin to taking an 80-year-old man and dressing him in the clothes of a teenager”. I couldn’t disagree more if we’re talking about non-collector-grade guns. It’s more like taking a naked 80-year-old man and dressing him in a nice suit (even though it may not be a new-looking suit). Which would you rather look at? What needs to be remembered is that there is a world of difference between “refinishing” and “restoration”. The term “refinishing” could mean hot-bluing a single-action (where hot-blue wasn’t invented till about 1937). But “restoration” means doing things right. It means doing it precisely like it was done 80 or 150 years ago by the factory. It means polishing in the exact way the factory did it, and finishing the exact way the factory did it. There are only a handful of restoration-gunsmiths in the world who can do that… or who will do that. To that handful you can entrust your antique arms. Editor’s Note: Sadly, Bill Adair is no longer with us. His skill, knowledge and friendship will be missed.